Notice the 1860-1900, 1900-1920, and 1938-1940 periods, all caused by disturbance. The final update! Well, here I am again to give you a final update of the going-ons of my project. Upon completing the remote sensing part of my study, I’m not surprised at the findings. The orientation of the downed tree boles are completely contained within 30 degrees of due west. This is consistent with east-southeasterly winds present during the Hurricane of 1938. It’s a relief knowing that now I can attach my data collection with a certain event. After consulting with Charlie Cogbill, a historical ecologist and allometry enthusiast, I have reduced a set of allometric equations to describe biomass using only measured tree heights. Not only were the results surprising, but substantially large. The equations estimate that the Hurricane of 1938 downed about 15-35 , enough to substantially change the carbon pool and nutrient cycling of Watershed 6. However, what does this say about the history of Watershed 6? Of the Hubbard Brook valley for that matter? Using the information gathered from my study, combined with that of Charlie Cogbill’s and building on others work such as Yamaski and Leak (2006) or Leak (1987) I have preliminary conclusions. What happened in Watershed 6? 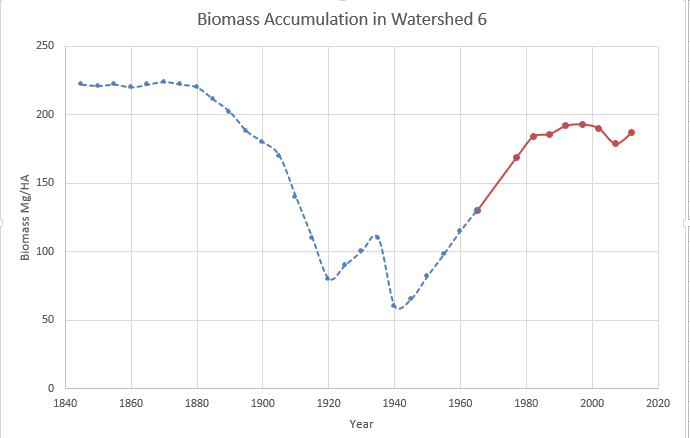 Here’s what a timeline of above ground living biomass (AGLB) of Watershed 6 would look like: I’d say that the Great Gale of 1815 reduced AGLB 15-35 followed by a 50 year recovery period. 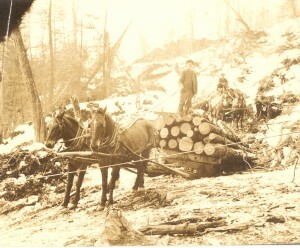 Then came the Spruce cull of 1870, which reduced the AGLB about 40 . By this point the AGLB is down to about 170 . Then comes the general cut, which slams the Watershed and reduces the biomass even further to 80 , followed by an 18 year recovery and regrowth period. 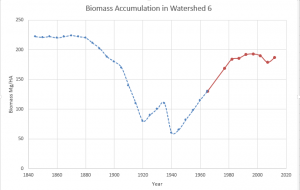 The recovery period allowed the biomass to rise to 110 , before dropping another 50 from the Hurricane of 1938. Since 1938, the Watershed had gone basically undisturbed except for a few droughts and soil freezes. Understanding the historic carbon flow through an ecosystem is particularly important at Hubbard Brook. Watershed 6 plays a major role as the biogeochemical reference watershed, giving understanding and significance to the watersheds in which experiments are performed. How much of the current carbon budget was supplied by the Hurricane of 1938? A lot? Any? Without a solid understanding and knowledge of previous nutrient cycling, can we really consider it a control? Judging by the amount of biomass on the forest floor and the motives of the loggers to harvest primarily Spruce and Hemlock, a hardwood harvest seems unlikely. If the loggers were after hardwoods, the general cut would have been much more extensive. In addition to the merchantable interests of the loggers, the sawmill and Mirror Lake could simply not handle hardwoods nor could they river float them (Hardwood is too dense to float). Surveys provided by Bormann et al. (1970) confirm that cutting stumps were only present throughout half of Watershed 6 further confirming the Spruce theory. All evidence seems to paint a picture of what the dominant species of the forest once was. In addition to current dominants such as Beech, Yellow Birch, and Sugar Maple, Red Spruce could have possibly composed about 40% of the forest. Hey all! Here I am to give an update of my project. 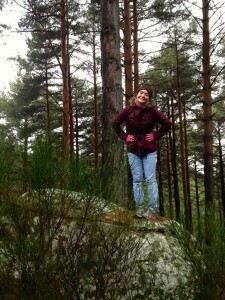 As the title suggests, tree coring gives you sore arms. Tree cores and aerial photography dominate my day to day. The cores are telling an interesting story: the forest was disturbed more than once. By analyzing general patterns in the rings, several occasions where increased growth and suppression are obvious. Some of these years directly coincide with known disturbances such as the Hurricane of 1938. However, not all of the events coincide with known disturbances. Whether these events are site-specific or cover the regional area is yet to be told. Geo-referencing and creating a scale for the 1940’s aerial photography has proven frustrating and quite difficult. After multiple failed attempts at superimposing the gridding system over the aerial photography, I figured out the most appropriate method. Believe it or not, I went old-school and superimposed the grid with an acetate layer. Not only was it easier, but it kept the process simple and eliminated distortion inherent in geo-referenced products. I documented about 710 trees with substantial length – long enough to measure with Vernier calipers. Using the scale produced by geo-referencing the aerial photos, I was able to estimate the length of each tree bole. Using allometric equations based on the dominant species of a northern hardwoods forest, total fallen biomass can also be estimated. 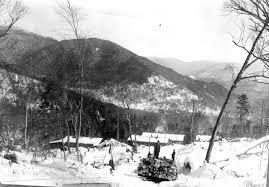 Logging camp somewhere on the north facing slopes. Photo courtesy of C. Cogbill. DISCLAIMER: I must confess that I never planned on harping down the exact number of fallen biomass and carbon, but rather produce a range of possibility. The methods used produce considerable uncertainty, but when the uncertainty is considered throughout the process, a viable range of possibilities can be produced. Based on the results I have now, I can confidently state multiple preliminary conclusions. To begin: there were multiple recorded and multiple unrecorded disturbance events in the study area. Secondly: The Hurricane of 1938 felled a significant amount of biomass (and carbon), possibly proportional of up to 25% of the previous standing forest. 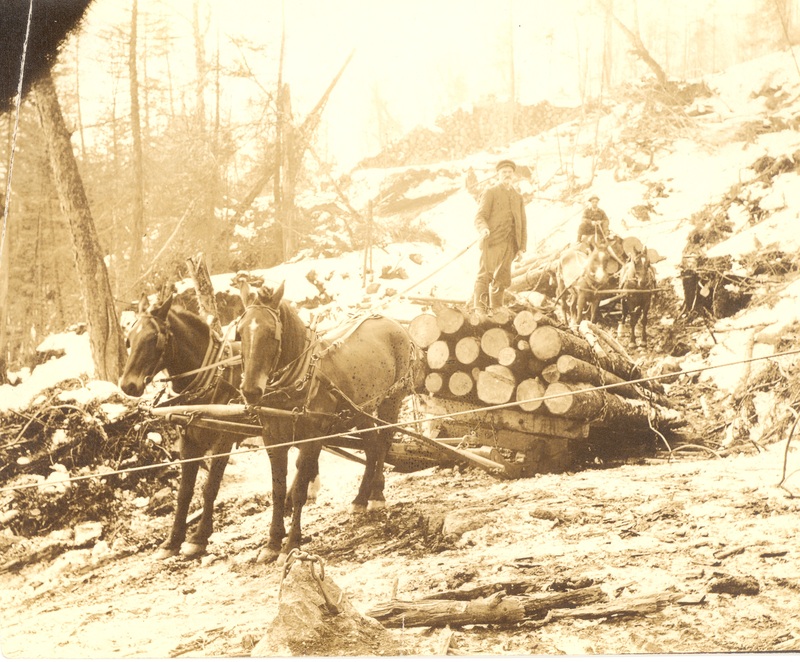 Thirdly: The 1900-1920 logging event was not particularly severe in the study area. Four: Don’t core Hemlocks; they’re usually a waste of your time. Five: Tree size is never an accurate representation of age. 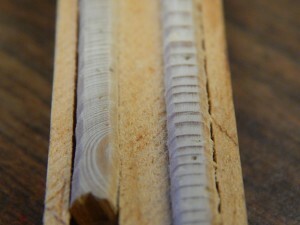 If a Spruce is big – core it. If Spruce is small – core it. 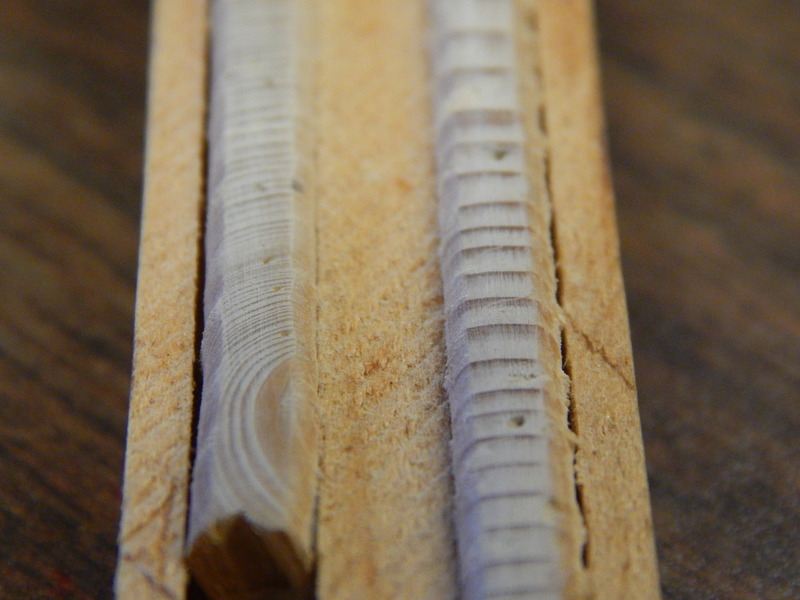 I recently sanded and counted a 144 year old spruce core, barely reaching 2” in length. If you see a decent Spruce, core it because you never know how old it is. What happened in Watershed 6? Photo courtesy of C.Cogbill. Further conclusions will be posted soon. Kelly: It was such a wonderful opportunity being able to attend the Cooperator’s meeting this year. 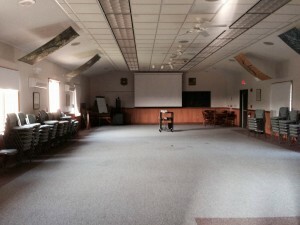 So much diverse research goes on here, ranging from microbiology to social reactions to climate change research, from meteorology to orchid studies, and the meetings are a wonderful way to bring the large and heterogeneous community of Hubbard Brook together to learn about all that goes on beyond our narrow research focuses. So much of the material covered flew completely over my head: it was both humbling and inspiring to realize just how much I have yet to learn in my field. Presenting at the meetings myself was, admittedly, fairly nerve-racking. Cailene and I, who have worked together closely throughout the summer and generally function to keep each other sane, in this case only served to enable each other’s madness. I think we are both naturally anxious people, and the prospect of presenting our research in front of such a large and expert crowd was, to say the least, intimidating. I do not know how many times we practiced our presentations for each other, or how many silent glances of mutually-felt panic we exchanged in the days leading up to the meetings, but I do know that by the time I actually stood up to present, Cailene had heard my talk enough times that she probably knew it better than I did! Thank you Cailene, I’m sure I would never have been able to do this without your support! Though it was stressful anticipating the meetings, looking back in retrospect I am extremely grateful that I had the chance to present at the meetings, and in fact just to have been able to attend at all. It was a truly enjoyable and enlightening experience from start to finish. I’ve never been much of a public speaker, so the thought of giving a talk about my project to a sea of brilliant scientists had me shaking in my hiking boots. Together, Kelly and I spent hours upon hours practicing our talks and making endless corrections to our PowerPoint presentations. Kelly, my mentor Dr. Scott Bailey and Maggie Burns (who is a research tech and good friend at HB) were extremely supportive and helped make my talk a success that I look back on with a smile (Many thanks to those three!). From preparing my data and making the presentation, to delivering the talk with confidence and enthusiasm, the entire process was an invaluable learning experience. The best part of all, however, was getting feedback from scientists of all different fields and leaving the meetings with new and exciting ideas for my project! The meetings were a wonderful experience and I am incredibly grateful to have had the opportunity to be a part of this annual event! David: This was my second year giving a presentation at the annual cooperative meeting. I truly enjoyed the opportunity. Though it is definitely a nerve racking situation to stand in front of so many highly regarded and incredibly intelligent people, it was something that allowed me to learn and grow in so many ways. Listening to the presentations of others and seeing the passion they all had for their project’s was truly inspiring. The value of these meetings is truly priceless. The amount of knowledge I gained within that 2 day span is incredible. The feedback that other scientists from many different backgrounds provided me has propelled my project forward. If you’re a lover of science and you have the opportunity to attend the meetings, do not pass it up! I look forward to attending again. I was also immensely impressed with the presentations of my fellow REU’s. They were able to grab my attention and keep me wanting more. Now that’s saying something because they were talking about soil and I am a meteorologist! I give huge props to all of the speakers at this year’s meetings and especially to Cailene and Kelly! 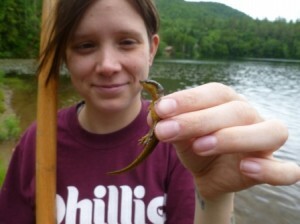 I found a newt (Notophthalmus viridescens) in the nearby Mirror Lake while capturing Sunfish. Hi! My name is Tiffany Lutz and I am a senior at Rutgers University currently studying Biology. For as long as I can remember I have been interested in the great outdoors. While growing up in South Carolina I was always finding ways to get my hands dirty outside and discover what lay just beyond our back door. After finishing at Rutgers I plan on applying to various Graduate Programs that focus on Ecology. While I am interested in all living creatures, my main passion and focus is amphibians and reptiles. 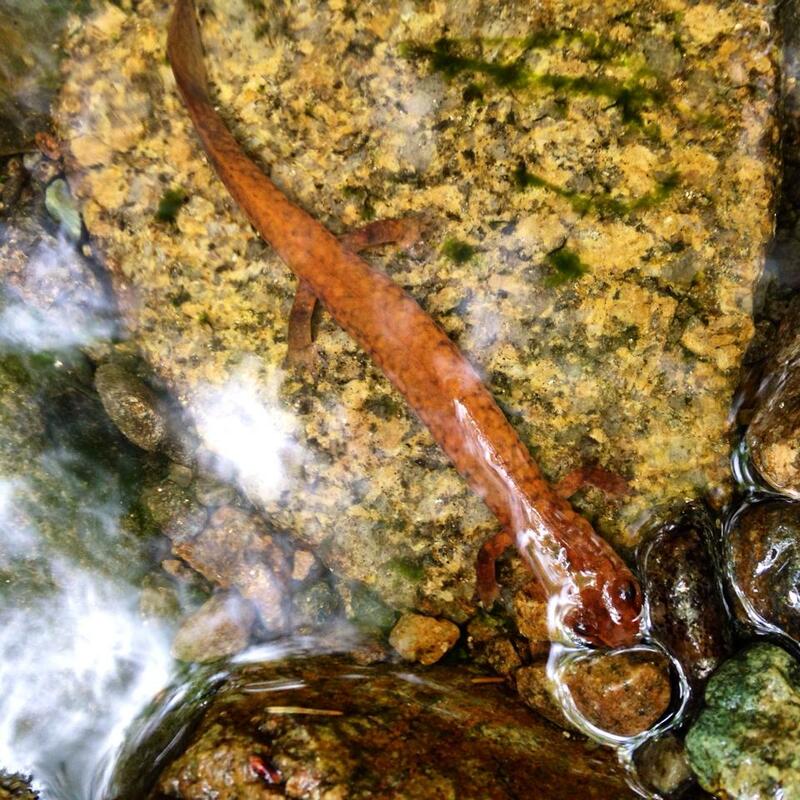 Thus, my project this summer at Hubbard Brook is observing if Brook Trout (Salvenlinus fontinalis) and Sunfish (Lepomis gibbosus) have any impact on Spring Salamander’s (Gyrinophilus porphyriticus) foraging and activity levels. Lepomis gibbosus is not found in the streams with Gyrinophilus porphyriticus, but have recently been introduced to nearby Mirror Lake. It is well documented that non-native introduced species have led to a decline in amphibian populations in various areas around the country. My research hopes to prove that Gyrinophilus porphriticus would be at a great advantage if they could recognize these non-native fish as potential predators. In addition, I am working on a side project where I am sampling four different streams for Brook Trout. For this project I am taking notes on their microhabitats and safely catching and marking them in an effort to track their movements within the streams. I find it fascinating how two species can be vying for the essential same resources, but still manage to strike a balance in day-to-day life and coexist. I am looking forward to finding out the results! The research is keeping me busy, but also giving me tons of new experiences. My name is Briana Becerra, I hail from the beautiful state of California. This upcoming fall semester I will be a junior classman at California State University Monterey Bay; there I study Environmental science, technology, and policy with an emphasis in ecology and minor in biology. When not being driven into an early grave by school related stress, I enjoy longboarding, reading, listening to music, and quoting geeky movies during social situations. I found science to be the most fascinating subject in school; I enjoyed learning about the natural world and the relationships that exist within ecosystems. 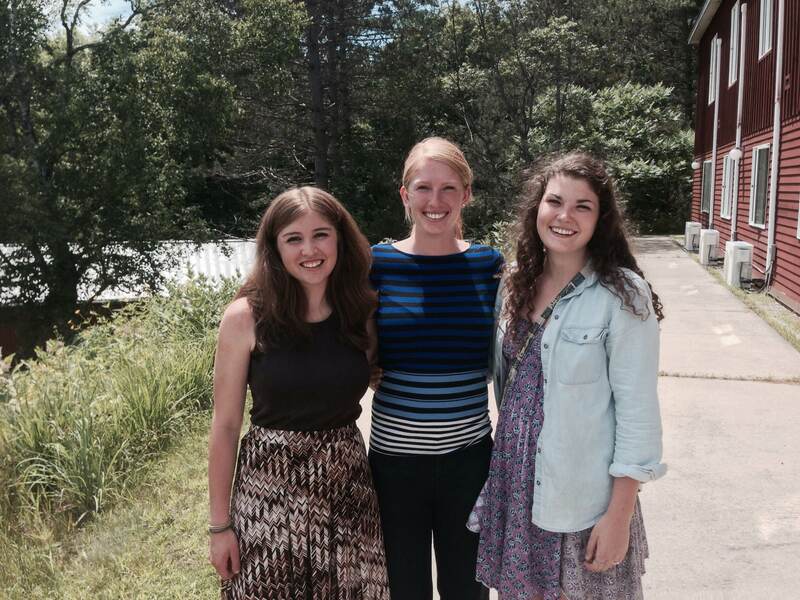 I am beyond ecstatic that this summer I was given an opportunity to participate in a research project at the Hubbard Brook Experimental Forest in New Hampshire under the mentor ship of Dr. Natalie Cleavitt. 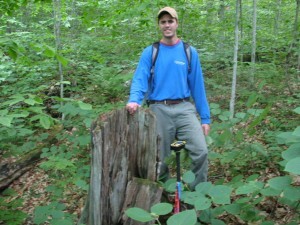 This summer I will be comparing tree regeneration patterns in 30 and 100 year old northern hardwood forests. I will be paying special attention to seedling age structure and the mycorrhizal colonization of young seedling roots and their relationship to light levels and litter inputs. The focal species include American Beech (Fagus grandifolia ) and Sugar Maple ( Acer saccharum). 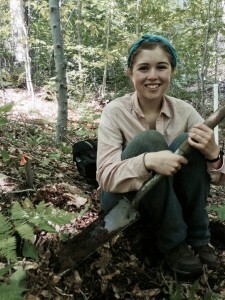 The principle areas of study include lower and mid elevation herb plots on watersheds five and six of the Hubbard Brook Experimental Forest. Seedling counts will be taken and comparatively analyzed between watershed five, a recovering disturbance area, and watershed six the reference watershed of Hubbard Brook. A total of five hundred 1mby 1m plots will be analyzed in their composition and seedling demography to determine the effect of light on seedling regeneration and mycorrhizal fungi colonization. This is my first summer research experience as an undergraduate. As scary as it is to be so far from home, the knowledge and experience I am gaining as a field researcher cannot outweigh my homesickness. I hope many individuals will consider and apply to this amazing research opportunity here at Hubbard Brook. Thank you for your time. Hello! My name is Kelly Floro. 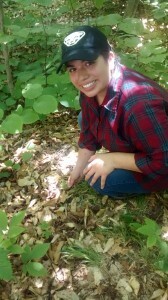 I am a rising junior at George Mason University in Fairfax, Virginia, where I study environmental science with a concentration in ecology. This subject has fascinated me for as long as I can remember, and my love of the outdoors has always spurred my passion for environmental studies and sustainability. In my spare time, I enjoy reading, hiking, beekeeping, gardening, and baking. I’m very excited by the opportunity to spend this summer conducting fieldwork at Hubbard Brook. It has thus far proved to be a wonderful way to learn more about my field of study while spending time outdoors getting acquainted with the White Mountains—in particular, with the soils. I am working with Dr. Scott Bailey on a project to characterize the variability in soil properties throughout the Hubbard Brook valley. Specifically, I’ll be looking at the C horizon (which is essentially the bottom-most, least weathered layer of the soil). I want to find out how the properties of the C horizon, especially with regard to water flow, vary throughout the experimental forest. How easily does water flow through the soil? What is the relationship between water flow and properties such as soil structure, particle size, and density? We know that soils throughout this region are derived from materials that were deposited by glaciers during the last ice age, but are subtle differences in the nature of this glacial material influencing soil characteristics and hydrology? Understanding water flow and deep soil characteristics is important because it tells us much about the properties of the soil and landscape through which that water is moving. It can tell us about soil stability and flooding potential for land use purposes, and can provide insight into how soils in this region were formed. Furthermore, by understanding how quickly water flows and in what direction, we can predict how nutrients and environmental pollutants carried by water are moving and where they might end up, which has implications for both human and environmental health. I am so thrilled to be participating in this project, and look forward to the research ahead of me. Thanks so much for taking the time to check out this blog! I’ll be happy to keep everyone posted on my work as the summer progresses. Jessica hiking in the Sierra de Francia! Hello everyone! My name is Jessica Hernandez and I am originally from the Central Valley of California. Growing up with the valley at my feet, a trio of mountain ranges in my backyard, and the ocean never more than a short drive to the west, it’s no wonder why I have been passionate about studying biology since before I can remember! As a rising senior and Biology major at Pomona College in southern California, I’ve become increasingly curious and enamored with the field of conservation biology and amphibians. So what better way to spend my summer than to study one of the most interesting amphibians on earth: salamanders! Under the mentorship of Dr. Jon Davenport, I will be studying the influence of behavioral traits on homing behavior in the northern spring salamander, Gyrinophilus porphyriticus, in the White Mountains of New Hampshire. To better understand this influence, I will be collecting two genetically divergent populations of salamanders from Kineo Brook and testing them for boldness or shyness traits. Afterwards, salamanders will be displaced from their original capture location to see if they successfully move back “home.” I’m looking forward to discover if there is an existing correlation between the boldness or shyness of a salamander and it’s movement towards or away from home. Understanding the ability (or inability) of salamanders to return after being moved away from their home will shed some light on how such individuals would respond to displacement as a result of natural or anthropogenic events, such as extreme flooding, drought, or urban planning. Overall, the ultimate success of salamanders when it comes to homing may have significant consequences in terms of isolated populations and gene flow. The behavioral component of this study is also important to consider since the “boldness” or “shyness” of an individual may be significant in his or her ability to home—or respond to displacement—successfully. An adult northern spring salamander! As a study species, salamanders, like most amphibians, are extremely unique in that they breathe partially or entirely through their skin. Northern spring salamanders, in particular, belong to the family of “lungless salamanders” and rely completely on their skin to breathe. This porousness absorbs water as well as gases, such as oxygen and nitrogen, which makes salamanders extremely sensitive to environmental changes. Since salamanders are able to absorb pollutants, their decline over the past few decades is a significant cause for concern. Therefore, understanding their movements and ability to respond to natural events will give us a window into current, and potentially impending, population and ecosystem dynamics. And, hopefully, by the end of the summer we’ll be able to use boldness and shyness trends in salamander populations to predict some of these movements! So far I am having an incredibly amazing time chasing salamanders in the streams of the White Mountains and exploring all of the natural treasures the Atlantic Northeast has to offer! Greetings from Thornton, New Hampshire! I’ll introduce myself as Jarred Jones, an REU student from Gettysburg College. I’m not actually from Pennsylvania though… Groton, Massachusetts is my hometown, not even two hours from Hubbard Brook. Groton is a classic New England town with a vibrant small population of humans and cows living together in harmony. Mostly cows though. Why am I here at Hubbard Brook? Here’s a little about myself. Growing up in Groton, I got a little bit of both worlds. I was close enough to Boston to experience the city life, but also rural enough to be embedded with a love for the outdoors. Fly fishing, hunting, and exploring characterize the majority of my time…when I’m not studying. I’m a rising senior and Environmental Studies major at Gettysburg College, double minoring in Biology and Mathematics. At Gettysburg, the Environmental studies major is relatively malleable, allowing me to create my own concentration – Wildlife Ecology. However aside from wildlife ecology I have a keen interest in disturbances in forested ecosystems – the theme of my project this summer. My mentor this summer is Don Buso, Technician and Manager of Field Research at HBEF. Together, we will be attempting to solve a simple mystery: what happened in Watershed 6, the biogeochemical reference watershed? 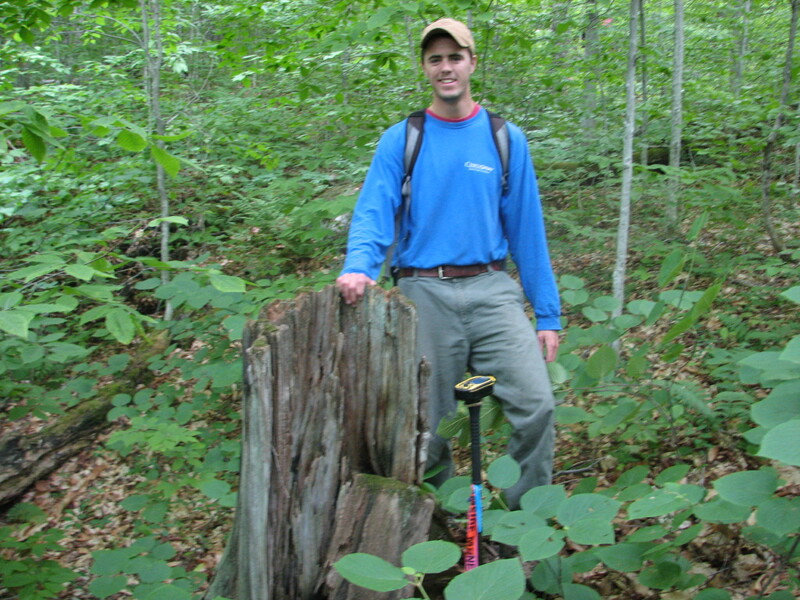 Recent work has theorized the growth regime of W6 over that past 40 years to be consistent with normal northern hardwoods biomass accumulation rates. Extrapolated backwards, it is logical to assume that Watershed 6 was clear cut in 1915. However, high-resolution photographs of Watershed 6 from the 1940’s and 1950’s reveal a mature deciduous canopy dotted with conifers and hundreds of fallen trees on the ground. These conditions would not have been likely had Watershed 6 actually experienced a severe cut 30 years earlier. The standing history of Watershed 6 neglects the 1938 hurricane and site-specific history that is an important factor in the growth regime pattern. Our study focuses on determining an improved history of Watershed 6, and approximate flow of soil carbon in the last 200 years. This is important because logging and disturbances can cause change in biomass and nutrients within an ecosystem, and these changes are difficult to quantify without a clear history. In addition, an accurate history of Watershed 6 is valuable for use in theoretical modeling of ecosystem development, resilience and sustainability at Hubbard Brook. Throughout the summer I will be taking cores from Red Spruce and Eastern Hemlock; both long lived species with distinct growth rings. I will be looking for years that the tree’s growth is suppressed and released, comparing them with years of known forest disturbance to create an accurate timeline. The 1940’s photographs will be used to estimate historic carbon flow through Watershed 6. Despite already having sore arms, I’m still excited for what’s to come! Wow...summer went by fast! The REU's have been done for about a week now, and are enjoying a bit of time off before starting school again. As a wrap-up, here is the program from the Undergraduate Research Conference that was held on August 10th. The students gave presentations on their research projects, and their communication projects.